The other night, I was into my 47th viewing of Big Night. I love the movie. At one point they begin making a timpano, a drum-shaped, pasta-encrusted, baked macaroni type of casserole The first step is making the macaroni for it. 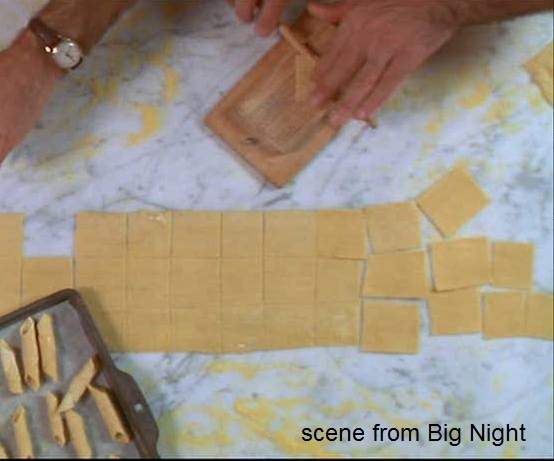 The screenshot below is Primo and Secondo making the individual pasta. From what I've been able to determine, it's garganelli, a type of pasta that looks like penne embossed with a heavy ridged pattern and done individually (unlike the smooth, extruded tube that is penne). It's made on a wooden jig with a pattern engraved in it and a tiny rolling pin. 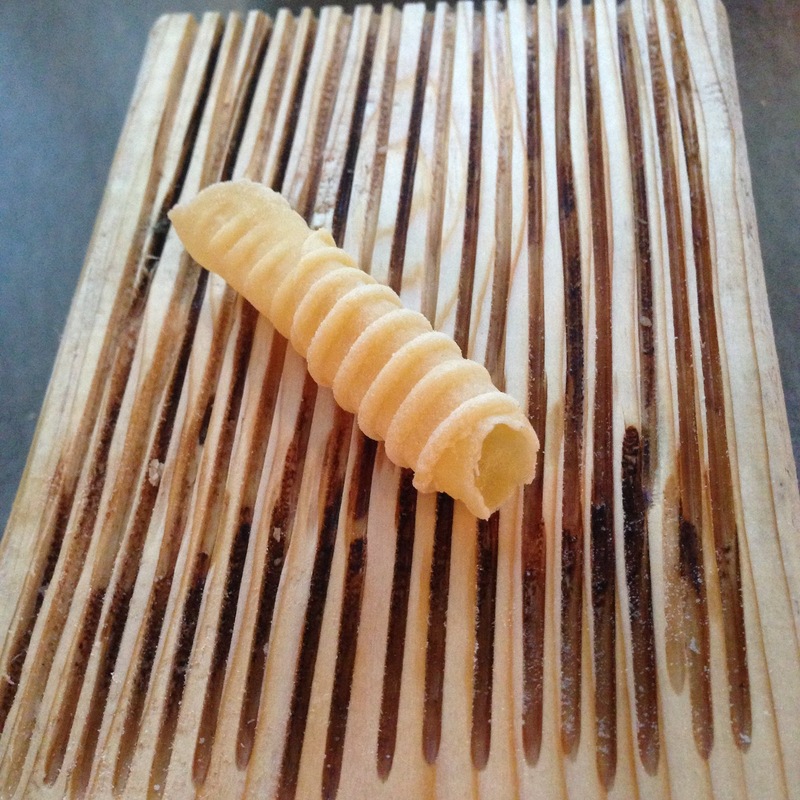 The pasta rolls into a tube, then gets mashed into the indentations on the wooden jig. I got a little obsessed when I saw this. Not so much for the timpano, but the patterned pasta looked tasty. 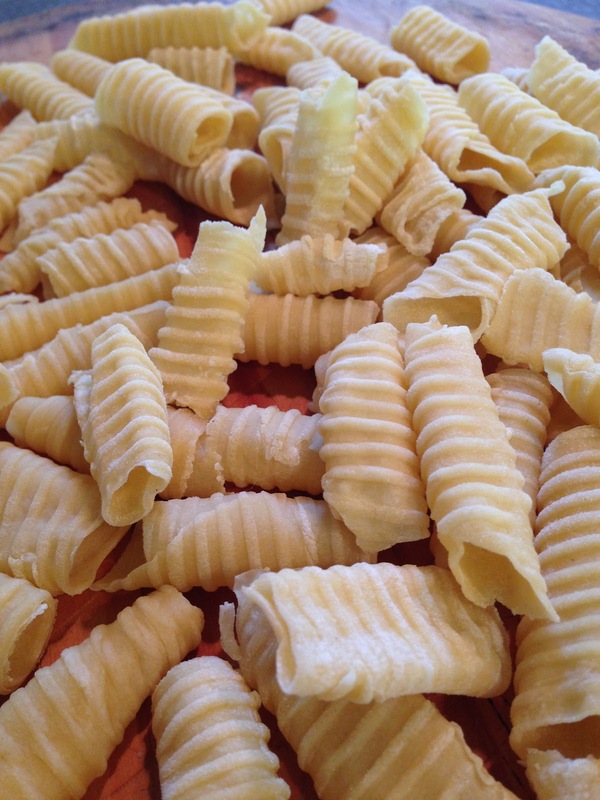 I also never imagined making little pieces of pasta would be feasible (but it is!). I looked it up and made a jig (these can be purchased somewhere, but I'm too cheap) out of a 2 x 4 and burned the grooves into it using an angle grinder. The metal cutting blade on my grinder burned the grooves into the 2 x 4 making a nice pattern that looked appropriate for this type of pasta. I used a 5/16" diameter oak dowel for the mini rolling pin. The next thing to consider was the dough for the pasta. It had to be dry enough to retain the shape of the impressions from the jig, *release* from the jig and mini rolling pin, but also soft enough to roll out. Pasta sticking to equipment is a big consideration in how dry/wet dough is mixed. mix together, knead lightly, squish into a ball and let rest at least 15 minutes. Scale to 10 x 40-50g logs. Roll each log into a long strip, ca. 1.5 - 2.0" wide and ca. 14" long. 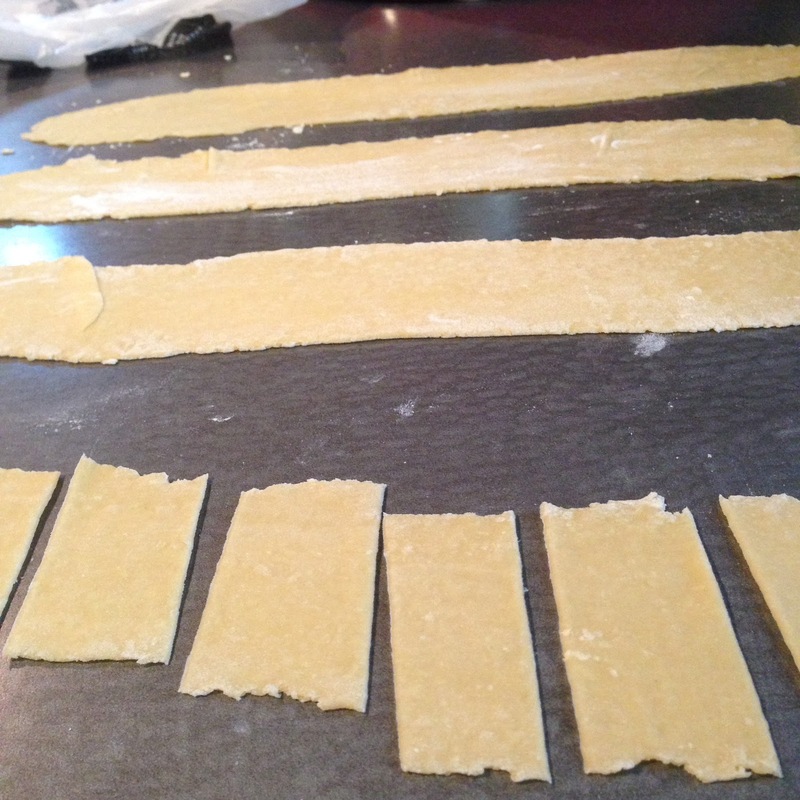 Cut the pasta strips into little rectangles. 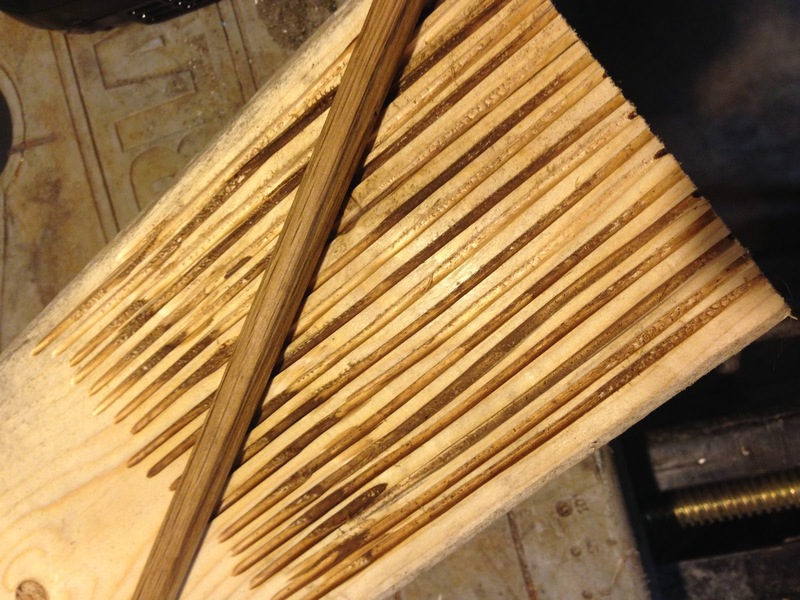 Each piece will get wrapped around the dowel, then rolled slowly and firmly into the grid of the rolling jig. This will crimp the dough closed and give the requisite exterior pattern. See next 3 images. Pasta rolled around the dowel. 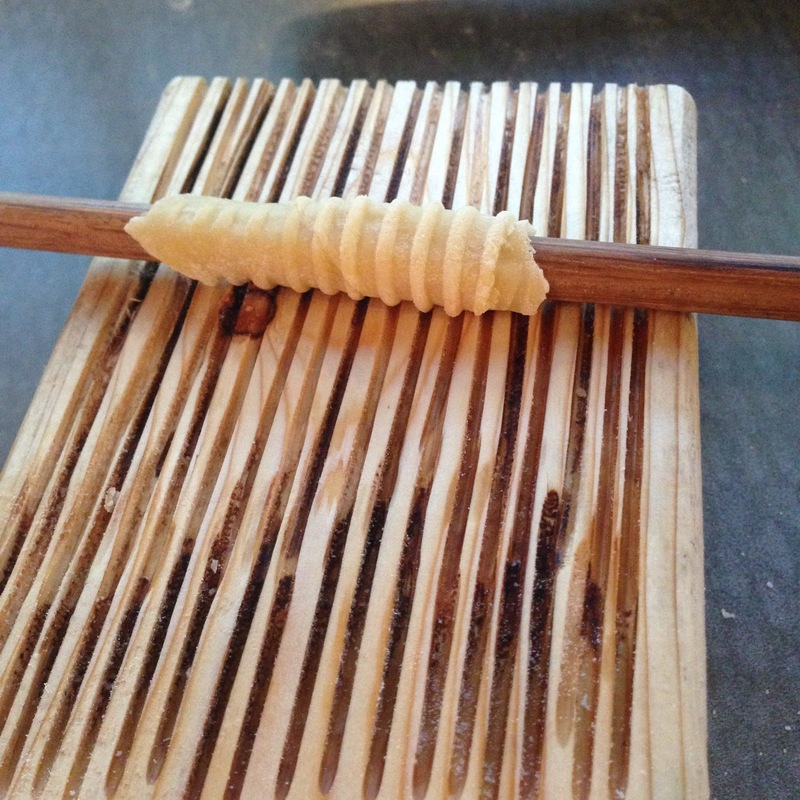 Once rolled around the dowel, use the dowel like a rolling pin and press the wrapped piece into the grooves. A pasta this dry should not stick. 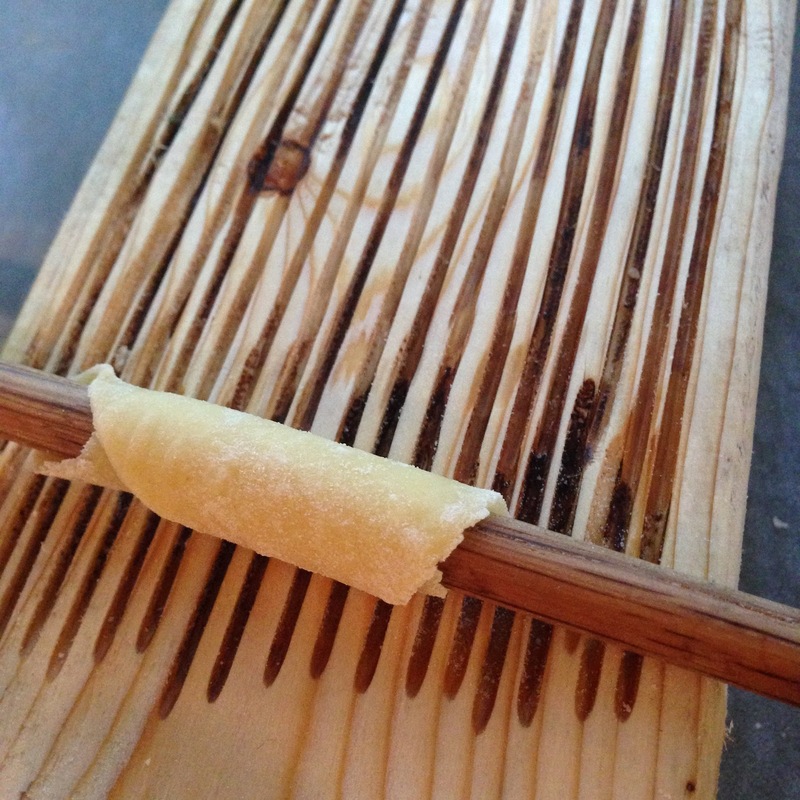 As the wrapped pasta is rolled/mashed into the grooves, the diameter of the tube will expand and release itself from the dowel; slide the pasta off of the dowel and admire your teeny weeny work of art.